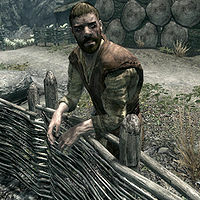 Hjorunn is a Nord lumberjack and operator of the Solitude Sawmill. He lives in the neighboring house and watches over his small potato farm and the mill with his employee, Kharag gro-Shurkul. He will pay you 5 gold per piece of wood. He starts his day at 6am, when he wakes to cook for an hour before going back to sleep for another hour. At 8am, he observes the mill operations for four hours, returning to cook at noon. After an hour, he returns to his work for another five hours, stopping for another cooking break at 6pm. At 7pm, he returns to his duties for five hours, finally resting at midnight. Hjorunn wears farm clothes and boots. He also carries two keys: one to his room, and the other to the sawmill (see bugs). Hjorunn wields an iron war axe in combat. When he sees you, he may say, "Come in, come in! I was just about to take a break." He will occasionally comment on his way of life, saying, "Living outside the walls is a risk, aye. But at least the guards don't come nosin' around." He will also tell of what trouble the civil war has brought him, "We had some trouble, while back. Stormcloak tried to set the mill on fire. But we sorted her out." Despite Hjorunn's line of "Living outside the walls is a risk, aye. But at least the guards don't come nosin' around. ", a Solitude guard makes regular rounds past the wood chopping block and workbench. The key to the sawmill unlocks nothing, as there are no doors within the mill. This page was last modified on 16 April 2015, at 10:59.